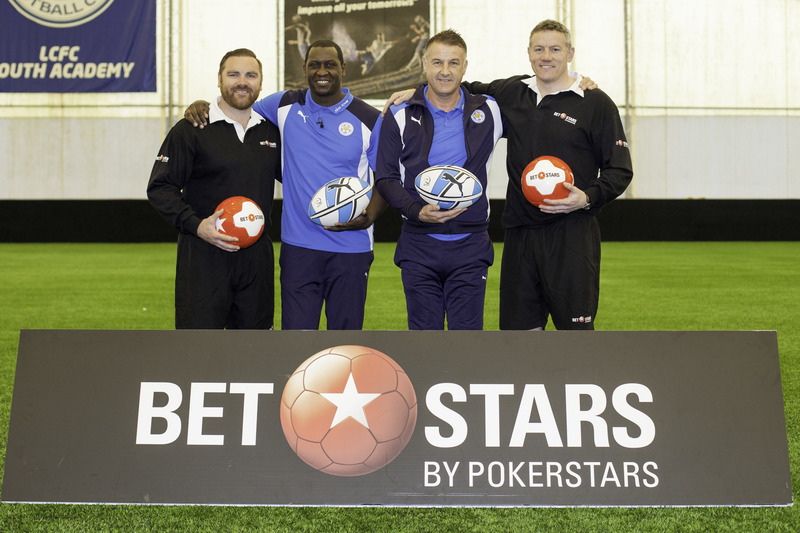 ONCHAN, Isle of Man - April 20, 2017 – Leicester City legends Emile Heskey and Steve Walsh swapped a football for an oval ball in a special rugby kicking challenge by online sports betting site BetStars, an Amaya Inc. (Nasdaq: AYA; TSX: AYA) brand. The Foxes duo were joined by Leicester Tigers legends and European Cup winners Tim Stimpson and Andy Goode, who gave the pair a goal kicking masterclass before Heskey and Walsh went head-to-head to see who could convert the most kicks. After successfully converting kicks from a variety of different angles the pair could not be separated on five points each and were forced to attempt sudden-death drop goals to decide the winner, with Steve Walsh grabbing a last-gasp victory with his final drop goal attempt. This is the third challenge in the BetStars Face-Off series, with Leicester City players Shinji Okazaki and Christian Fuchs having previously taken on the ultimate football robot, whilst Danny Simpson, Marc Albrighton and Fuchs swapped their football boots for hockey sticks as they took on Team GB’s gold medal winning hockey stars Maddie Hinch and Helen Richardson-Walsh.